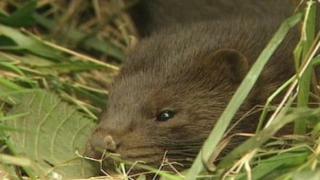 The American mink, which escaped into the wild after it was introduced to Britain for its fur, is trying to colonise Anglesey. It can decimate native water voles and attack seabird colonies. Until now the island has been relatively mink-free, but the discovery of a female well inland has set alarm bells ringing. They were introduced in 1929 and in the rest of the UK there are thought to be 37,000 American mink roaming wild. The Anglesey Water Vole project within the Menter Mon organisation is working to establish how well-spread the mink are with a view to trapping and removing them. "Basically we are setting rafts with a tracking cartridge inside with a layer of clay on top so that when there is mink in the area they go in and leave footprints so we know they are there," said Gareth Pritchard from the project. If American mink are found live traps are set and the creatures removed. "They are very efficient predators which shouldn't be here so if they get established, especially the female, they can clear areas of bank and river because of the way they hunt as mink females go down water vole burrows," Mr Pritchard said. The discovery of the female mink was possible after extra funding was allocated to the Water Vole Project and it is of particular concern, he added. "When mink are trying to establish themselves there are males first as they travel a lot further, so because the one we found is a female it's quite worrying that they are trying to establish themselves further north," he said. "Anglesey is a key area for water voles in Wales and also breeding seabird colonies - and they decimate those as well - so it is crucial that we keep them away," Mr Pritchard added. American mink were introduced to Britain in 1929 to fuel the fashion for fur.